Should Bernie Sanders be the Left’s presidential candidate in 2020? Hamilton Nolan and Bhaskar Sunkara revive the great American tradition of arguing about Bernie online. The 2020 election campaign is now upon us, which means it’s time to argue about Bernie Sanders on the internet. Splinter’s Hamilton Nolan recently weighed in on the question of whether or not Sanders should run, answering firmly in the negative. Jacobin publisher Bhaskar Sunkara heartily disagrees. Below they debate the differences between Sanders and progressives like Elizabeth Warren, and why nonelectoral organizing is vital to the rising left’s agenda no matter who runs for president. As you know, I’m a Hamilton Nolan completionist, so I was disappointed to see that you’re skeptical about Bernie 2020. 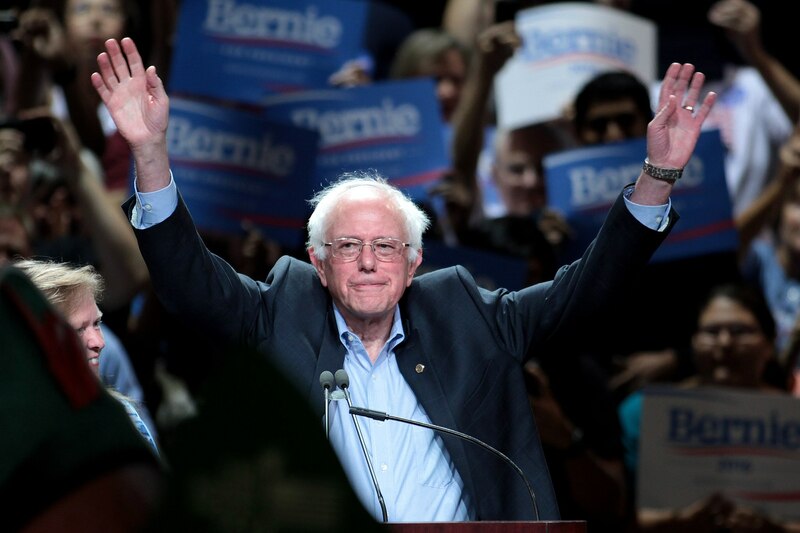 To me, he’s qualitatively different than any other candidate, the only person capable of reaching a national audience with a message about providing Americans with the basic goods they need to live a decent life like health care and affordable housing. And his message about who’s responsible for inequality, and who we need to take on to change things seems to me different than any other potential 2020 candidate. Why are you hesitant about embracing a seemingly inevitable Bernie run? I’d like to qualify this discussion with some caveats: it’s very early, only a few candidates have declared, we haven’t seen anyone’s platform, and also, I have no idea how anyone will vote in 2020. That said, I do think that the Democratic primary is going to be essentially a contest between the left wing of the party and the centrists. I have two primary reasons why I don’t think Bernie should run: 1) He is very old. He would be eighty in his first term. This is not disqualifying, but it’s not ideal. All great leaders have to step aside one day. And 2) Because it is still so early, I think that Bernie could get behind a good candidate now — who embraces his ideals — and avoid the possibility of splitting the lefty vote and allowing a centrist to win. I think it’s clear who’s running. Elizabeth Warren has announced, as has Tulsi Gabbard. Cory Booker is hanging out in Iowa. But my question to you is, who would be a good candidate? To me, Bernie is not just a progressive Democrat, he has a different base and appeal. He’s greater than the sum of his policy positions. Because Sanders simply has a different approach to politics than other potential Democratic primary contenders like Elizabeth Warren. Consider how simple his messaging was during his campaign: he was more repetitive and used an even simpler vocabulary than Trump. He told people that they work hard and deserve more, and the reason why they didn’t get enough wasn’t because of minorities and immigrants, but because millionaires and billionaires were profiting from their situation. Bernie was politicized in the Young People’s Socialist League back in the day, and I think that’s still apparent in how clear and powerful his worldview is: the knowledge that there are powerful interests that need to be taken on if we’re to make change. I don’t see that in any other candidate. It’s not just about “here are some policies I support,” it’s about putting together the type of class power that can actually make change happen. If Rep. Alexandria Ocasio Cortez was over thirty-five and wanted to run, that would be another thing. But I don’t think there any Democrats are quite interchangeable with Sanders. I also don’t think there’s anyone that has the same appeal with swing voters and those in the Rust Belt states that Trump used to sneak into the White House. I am a big fan of Bernie Sanders politically. I think the broad success of his 2016 campaign really opened up a lane in mainstream politics for the Left that hasn’t been there in my lifetime. He talked about starting a movement, and he has done it. And I think he would agree that the important thing is not his own personal political success, but the question of how we can actually put meaningful policies that help people into place, and how we can have success turning back the inequality that underlies so many of America’s problems. Principles before personalities. Of the candidates that are or seem to be running now, I guess Warren is the obvious choice, although my idea would be to let Bernie himself handpick someone younger who best embraces his ideals and get behind them. But even if it is Warren — who I think is generally very good with at least one obvious recent exception — I don’t see that as a great loss in terms of the issues at hand. Whether Bernie or Warren are president, how would they try to roll back inequality? They will use the tax code, and they will use the regulatory agencies, and they will try to work with a Democratic Congress to pass laws friendly to labor and increase financial regulation and enact better, more redistributive tax policies and pursue universal health care and other basic goals. I probably like Bernie’s politics a little better than Warren’s, but I don’t think there would really be a ton of difference between their actions as president on the major issues. I also think that having a very old guy like Bernie as the head of our movement has downsides that have to be considered. That is not a knock on him — we’ll all get old one day if we’re lucky. But leaders have to nurture new generations for movements to continue and thrive. And if there’s not going to be a real serious loss on the issues, I would prefer someone even ten years younger than Bernie. I would love it if Bernie was younger, but I can’t help but feel like if Bernie were ten or twenty years younger, he’d be a whole lot worse than he is today. Maybe what we like about Bernie is that he emerged from an American left that has long since been defeated, but that at a certain point was capable of politicizing and training people and then throwing them into an environment where they could actually engage in mass working-class politics. That’s what Bernie did in civil rights and labor struggles in the ’60s and he tried to do with a great deal less success in the ’70s and ’80s. I’m sure his politics have shifted since then, but his message has displayed a straightforward consistency. I trust him for that. Warren is certainly a progressive, but I worry that she’s getting love from many mainstream Democratic Party policy types, people that went to war with Sanders. And that she doesn’t have the same anti-establishment appeal as Bernie and will compromise at key moments under the pressure of capital, precisely because she doesn’t have a movement-based vision of political change. And if we’re going to get pragmatic about it, Bernie Sanders is someone who’s already been tested at the national stage. Every little bit of dirt about him has been brought out, and he’s still incredibly popular. I don’t put too much stock in early polls, but he’s even beating Warren in Massachusetts. Can you imagine her doing the same in Vermont? I’m also, by the way, not convinced that the two would compete over the same voting bloc necessarily. The degree to which Bernie got the support of people previously alienated from politics or who self-described as “moderates” shouldn’t be understated. While keeping in mind my “all predictions are worthless” caveat, I do agree with you that as a practical issue Bernie is a more charismatic and fierier speaker who will probably do a better job of turning out people who don’t usually vote. On the other hand, also as a practical matter, I don’t think voter turnout among Democrats is going to be a serious problem in 2020 — the motivation to beat Trump is extremely high. If you just take the 2016 vote and add in the burning desire everyone has to get rid of Trump, this is really the Democrats’ election to lose. I would depart from you in that I don’t really worry about Elizabeth Warren, of all people, falling prey to the pressures of capital. She has built her career on fighting the abuses of the American capitalist system, and I believe she’ll keep that up. If anything, I think a Warren candidacy would expose just how awful Wall Street truly is. All the money guys who usually give to moderate Democrats would back Trump, since they hate higher taxes and regulation more than they hate children in cages. If you don’t like Warren, I wonder if you think there are any other people Bernie could reasonably recruit to run for president that you would feel okay getting behind, since Ocasio-Cortez is sadly too young? I agree that it’s the Democrat’s elections to lose. They’ll likely beat Trump whether they tack to the center or the left. That’s all the more reason for us to go out there and put forth a credible left alternative. I think Warren is fine, but her vision of change is a regulatory one. She believes in the core of free-market capitalism, she just wants to make sure to the rules of the game are clearer and fairer. I’m skeptical of a potential candidate who’s out there now telling CNBC that she’s a “capitalist,” just one that doesn’t believe in “cheating.” To use a historical example, it’s like the battle in the early twentieth century between trust-busting progressives and more radical social reformers. Bernie comes from the latter tradition. Our new batch of potential post-Bernie candidates will come from movements. I’ve been so impressed by some of the teacher leaders that have emerged out of strikes in recent years — from Karen Lewis in Chicago to strikers in West Virginia, Oklahoma, and elsewhere. I’ve been impressed by the leadership of National Nurses United’s RoseAnn Demoro. Out of the spark that Sanders helped start emerged organizations like Justice Democrats and the rebirth of the Democratic Socialists of America that brought us Alexandria Ocasio Cortez and other new working-class leaders. I think we need Bernie 2020 and time to help develop and train more people in this mold. But at the moment, we only have one eligible national leader. Warren is a potential ally in the cause of social justice, but I see her as coming from a different movement. Its leadership fundamentally needs to be democratic socialist. I’m going to cast my vote against Trump, but not without advocating for the most forthrightly combative and progressive vision of political change. People are fed up and they want something different. Bernie, like AOC, is a candidate that can use the Democratic platform but not run as “Democrat.” That’s exactly what we need. You seem to see this as a zero-sum game. Can you imagine a scenario where Sanders is running and pushing Warren to the left, but Warren is making sure that the Sanders team is dotting all their policy I’s and crossing T’s or whatever it is people say? And in the end, they form an alliance and support whoever is more competitive in the last legs of the campaign? Trump certainly wasn’t hurt by having other hard-right candidates in the last Republican primary. I absolutely think that Warren and Bernie together complement each other and their combined strengths would produce a more ideal candidate. Indeed, that is what I am advocating, in the form of Bernie getting behind her or someone equally good early on. If he did, he could help pull her campaign to the left and unite the left of the Democratic Party around a clear favorite. It wouldn’t just be him. But the upsides would be that the set of political policies that got enacted would be virtually the same, we would have the first woman president, and she would be less likely to drop dead in office. Primaries aren’t quite a zero-sum game but splitting the lefty vote is a real issue — having ten candidates or whatever in the race this time is a lot different from 2016, when there were two. It’s easy to imagine a lot of early state primaries where the left vote gets divided between Bernie, Warren, and one or two others, and then Biden wins. Those early victories build on each other. Maybe I will turn out to be wrong about the centrist versus left nature of this election, but if not, this is a real risk. I think Trump was qualitatively different from the other Republican candidates in 2016 — he won because he was the most antiestablishment and unusual, not because of where exactly he landed in the traditional left/right spectrum. Maybe we can end this on a brighter note. I, too, am looking forward to the day when DSA candidates can make legit runs for national office on a much broader geographic scale. You’re probably a little more plugged into DSA than me (I am a dues-paying member but not a meeting-attender) — what do you think the prospects are for DSA in national electoral politics? I think the socialist left was basically dead in the United States up until a couple years ago. Now it’s for sure alive, but our pulse is weak. The biggest problem is that we don’t have a real working-class base. Through electoral races at the local and state level, through big national runs like the Sanders campaign, through strikes and social movement organization, we can start to build one. Ultimately, we have to be aware of our weakness and to what extent the return of democratic socialism has been just a media event. But I have a lot of hope. Everything in US politics is hollowed out and up for grabs. People are looking for alternatives. Whether or not its Bernie, I hope future left candidates match both his clarity and moral outrage about the fact that so many people are suffering in a world filled with so much abundance. I think on this point, we’re in complete agreement. I fully agree on the depth of the problems facing America. Fundamentally, we are facing a corrupt system fueled by crony capitalism that has captured our political system and led to an inequality crisis that is eating away our society on many levels. And it will take something very big to turn it around. As for Bernie, I will always give him credit for bringing the Left into mainstream politics more successfully than any politician I’ve been around to see. Ultimately, though, electoral politics come second — first comes practical institutions like labor unions, which demonstrate democracy in action. We need to rebuild organized labor in America — or build a new modern equivalent to labor in its stronger days — in order to lay the groundwork for any rise of socialism in politics. I guess we should stop talking and get to work. Hamilton Nolan is senior writer at Deadspin.